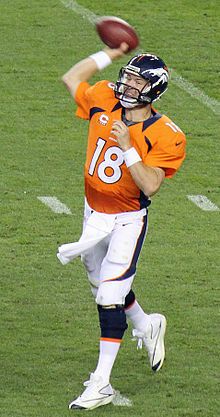 Peyton Manning holds the single season passing touchdown record, throwing 55 touchdowns in 2013. This is a list of National Football League quarterbacks who have led the regular season in passing touchdowns each year. The record for touchdown passes in a season is held by Peyton Manning of the Denver Broncos who threw 55 in 2013. Six quarterbacks have led the NFL in passing touchdowns in four different seasons (Johnny Unitas, Steve Young, Brett Favre, Drew Brees, Peyton Manning, Tom Brady), and one player (Len Dawson) achieved the same feat in the American Football League, the AFL. Johnny Unitas is the only player to win four titles in a row. Three players (Steve Young, Dan Marino and Brett Favre) have won three in a row.